← The Bet is On! The “Big Rocks” concept describes a vessel filled to its limit with large and small elements, all fitting together due to the order of their entry. 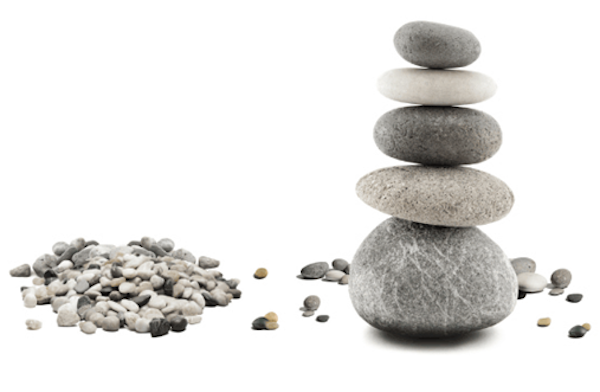 For the individual who desires a full and satisfying spiritual life the big rocks concept offers a visual of success. If our lives are filled primarily with things that matter least (materialism, pride, and a struggle for power) there will never be room for more important content (other people), and certainly no place for the Most Important (our Creator). However, if we prioritize the most important Factor in first, followed by the interests of others, and pour ourselves in last, we will find the perfect fit! Our world is full of distractions which matter least. The only way to keep life meaning-full is to make a daily effort to position the Big Rock first! This entry was posted in Christianity, Life and tagged Big Rocks, Christianity, Steven Covey. Bookmark the permalink.